Coach Mike Burgener called Bill Starr the best platform coach he’d ever seen. Starr could get more out of any lifter when it mattered than anyone else. What does it take to be a great coach (platform or otherwise)? An article about what’s involved in coaching athletes on the platform at weight-lifting contests—the job title is “Platform Coach”—might not seem relevant to many CrossFitters at first, but think about it: Competition works. That’s why, in my mind, lifting contests are essential to any athlete who is serious about getting stronger. Once I teach aspiring Olympic lifters how to do full snatches and full cleans, plus jerks, I insist that they enter as many meets as possible right away. The same goes for those who express an interest in powerlifting. Merely having an affection for the sport and a background of competing over a long career does not necessarily make for a good platform coach. Just as there are exceptional and mediocre coaches in football, basketball, and other sports, so it is in weightlifting. Some of the best train lifters in a home gym and never receive much recognition, while some of the worst have a long list of credentials behind their names and have obtained positions as team or national-level coaches, yet they are actually poorly-equipped to coach lifters at major contests for the simple reason that there’s a lot more to knowing how to prepare an athlete for his final training weeks, how to warm up properly, and perform up to the best of his ability than having won a national or international title. In truth, some of the very best platform coaches were unexceptional liters. 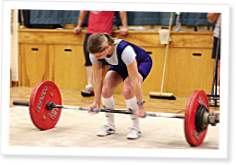 Included in the article are Coach Starr’s Six Basic Principles of Good Platform Coaching, including all lifters aren’t created equal, and remember that they are the stars, not you. Bill Starr explains why the feet are the key to almost any lift. Oddly enough, few strength athletes think about their feet when performing an exercise—but they should. Many parents let their children play football but believe weight training is too dangerous. Bill Starr examines the issue and explains how to train children safely and effectively. Do women require a different approach to strength training? Bill Starr doesn’t think so but offers a few tips for coaching female lifters. Just my download, or is the bulk of the text missing from this pdf? Same issue with the PDF here, using latest Acrobat 9 Pro Extended in Windows Vista. Yes, I'm seeing the same thing too. I suspect that the advice contained herein could be extended beyond the platform and directly into every gym in the World. Beautiful work, Mr. Starr. Thank you. Freaking Bill Starr. Bill, you are "the man" when it comes to S&C coaches. I hope that this is not your last submission. Great article - especially like the bit on not f-ing with stuff on competition day. Do what you know! Save the experimentation for the gym. Whatever they needed, I did. If I'd had this info before the first nationals I attended and attempted to coach a lifter through I wouldn't have made the embarrassing mistakes that cost one of my lifters 3rd place in his class. I've never forgiven myself for that and I never will. I used that experience as a spur to sit down and think my way through what I did wrong and how to do it better and I got pretty good at it, but it took me a couple more meets before I had it all under control. Oh how I wish I'd had this info then. Great, great article. It should be handed out in a sign-up pack to every lifter, several copies to give to all their friends who think platform coaching is just a matter of revving the lifter up. The only thing I'd add, and I'm sure Bill only omitted it because it was to him, so obvious; keep your head. I saw so many "coaches" ruin their lifter's meets because they got too excited and messed with their lifter's heads. "If you can't stay calm, don't come near my lifter." I don't know how many times I said, and a couple of times yelled, that at a well-meaning "helper".